Have you ever been done decorating your house? This is a phenomenon my husband doesn’t understand. He looks around, sees furniture, and thinks, ‘yep, it’s done.’ But me… not so much. 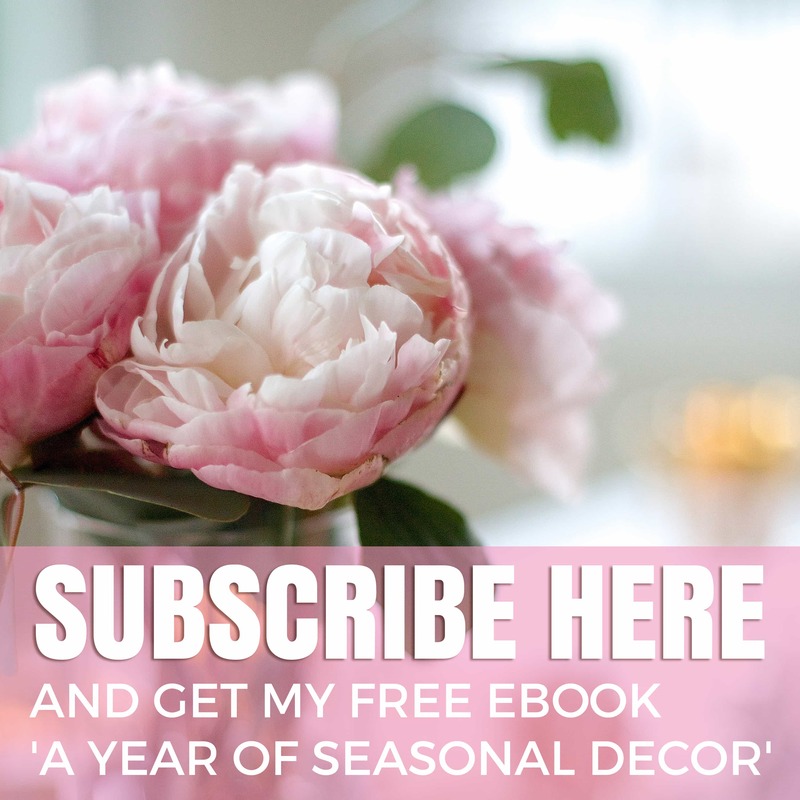 No sooner am I putting the finishing touches on one room, than my eyes begin to stray into the adjoining room and I start thinking about extending the new look into that room, as well. This is exactly what happened with my old dining room, above. You may remember the pink and green florals that have defined the room since we moved into our house. I pretty much took everything from our old home and added it right back into our new dining space. It was the first room I revealed way back in this post when we first started decorating our new townhouse, because it was easy to use everything I had before. It was even comforting. 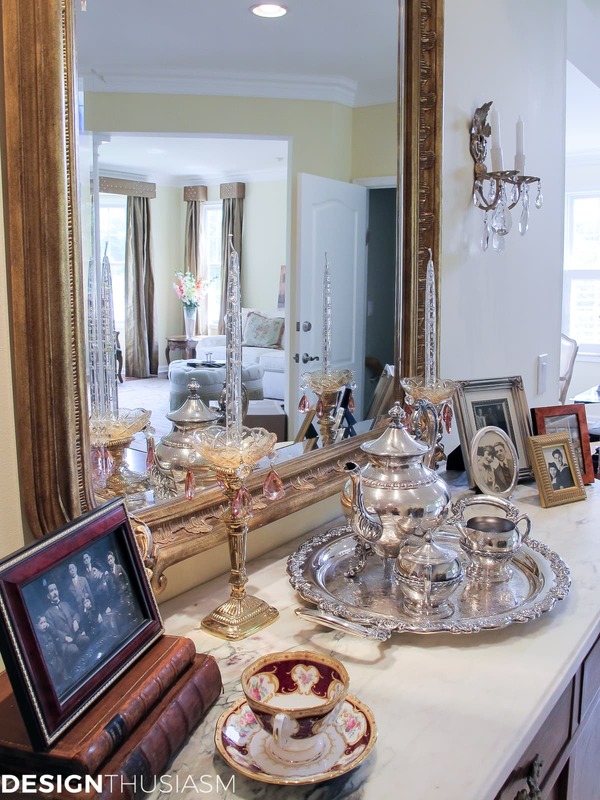 But after living in our house for a little over a year, my style began to become fine tuned and once we renovated our kitchen in a modern French style, I knew exactly how I wanted all my rooms to look. But Rome wasn’t built in a day, and I knew there was no way I could explain to hubby why we needed all new furniture because I was refining my taste. So I continued to walk past the dining room dreaming about how I would change it if I could. But sometimes that dream is all it takes. It’s where inspiration resides. And inspiration begets workable solutions. First you think about the ideal. Then you start to isolate the key offending pieces. Then you realize that with one epiphany, you can make some bold changes for a very reasonable amount of money. And that’s when the real plan begins to take shape. 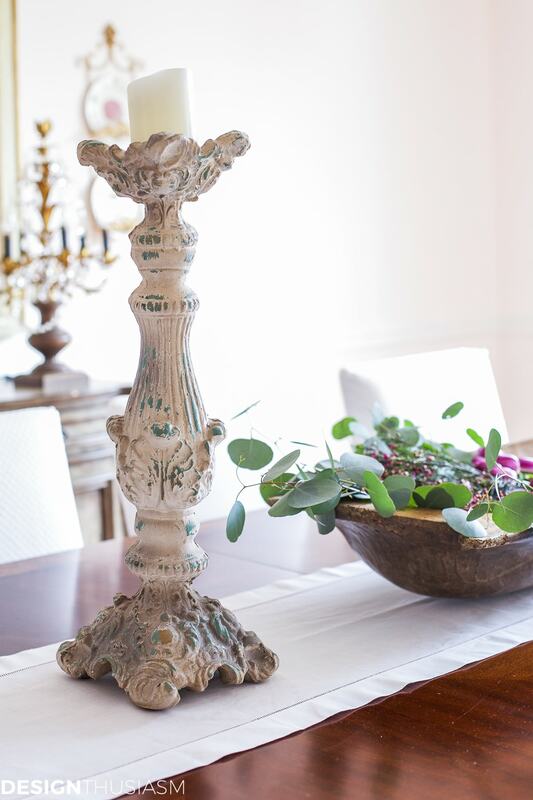 In this case, while I still think the florals are pretty and I just love pink and green, I’ve been wanting to update for some time and infuse my home with a more modern French style. For me that means more whites and less pattern, with an increased emphasis on antiques and aged patina. I should also underscore this is a work in progress. This is only the first step and some of stage two is already on order. The final pieces will have to wait for a while. So let’s take a look at the details and the process. Since I wasn’t planning to buy much in the way of furniture, my focus turned to accessorizing. The first thing I removed was the faux florals. I haven’t gotten rid of them and I’m not against using faux. There was just a bit too much color for the look I was going after. I determined to stay true to the 6 defining style elements I use in every room (if you’d like to see what they are, that post is linked to at the bottom of this post). That meant looking for crystal, gilding, patina and white linen. But the most significant change came when I realized I could simply recover my parsons chairs with an inexpensive slipcover in a quilted white fabric. That epiphany was my game changer! But first I was motivated by a few key accessories. I started with the crystal candelabra and then the tall chippy candlesticks. When the boxes arrived, I started to get excited. This is when I moved around some things I already had. The big French wall crown moved to the top of the painted cabinet. I hope to be painting the cabinet some time soon. I brought the big dough bowl in from the breakfast area and I realized a white linen runner was needed for definition. 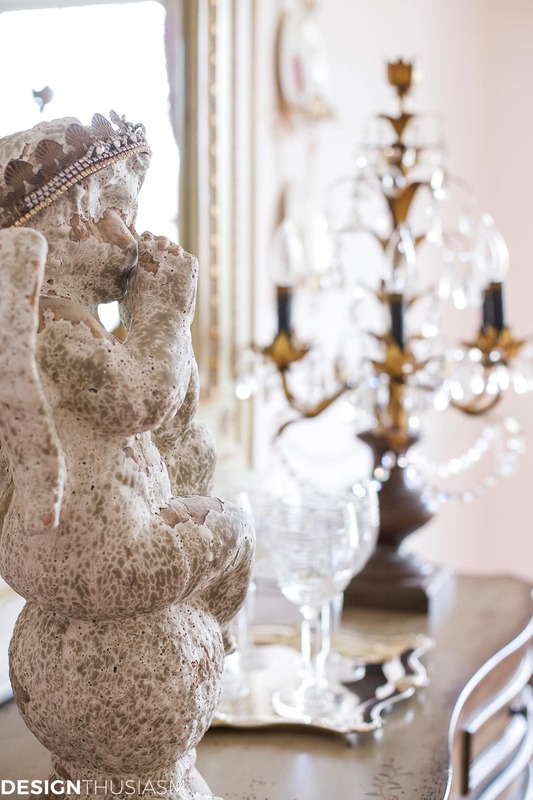 The candelabra went on the sideboard, balance by my garden statue in front of the French trumeau mirror. I also have sconces on order that will replace the plate racks and another exciting surprise that will be the most impactful element in the room. I thought about painting the walls, but now that I see all the whites and creams, I think I’m going to leave the blush pink. I do want to lighten that pantry closet which will likely be my first big painting project. I must admit I’m a bit intimidated. Honestly, this all started with this little candelabra. This one piece gave me the inspiration for the entire room. It became my muse and the rest followed. When I step back and look at the room as a whole, I’m amazed at the difference the white slipcovers made. I’ve decided, as well, that the drapery panels need to go. Not forever, but for now. A wispy linen panel is what I have in mind. And for down the road, the biggest change will be a crystal chandelier. I’m hoping vintage and it may not be for a while. But it’s coming for sure. And then finally, I’m thinking about some kind of rug. If you have ideas or suggestions, be sure to leave them in the comments. I’ll post the next round of changes in another month or so! Very pretty. That candelabra is gorgeous. 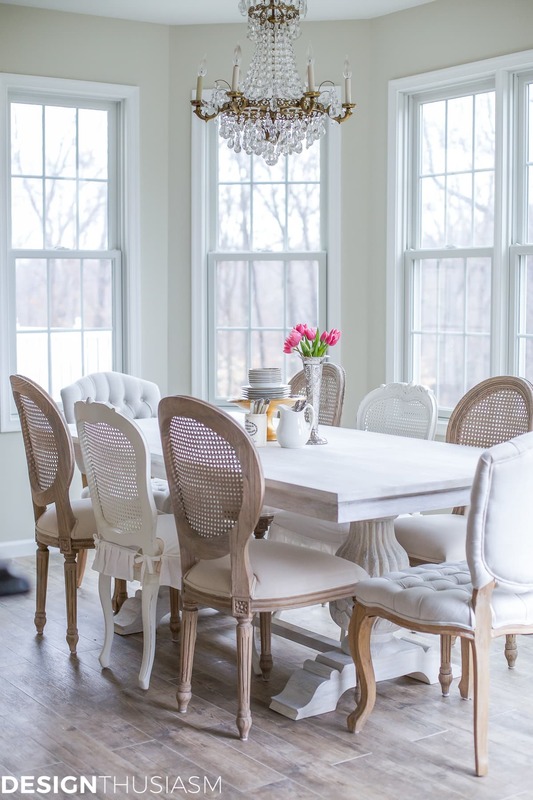 I did white slipcovers and am very happy–slipcovers are a good idea for any light color of furniture, and they immediately brightened everything. 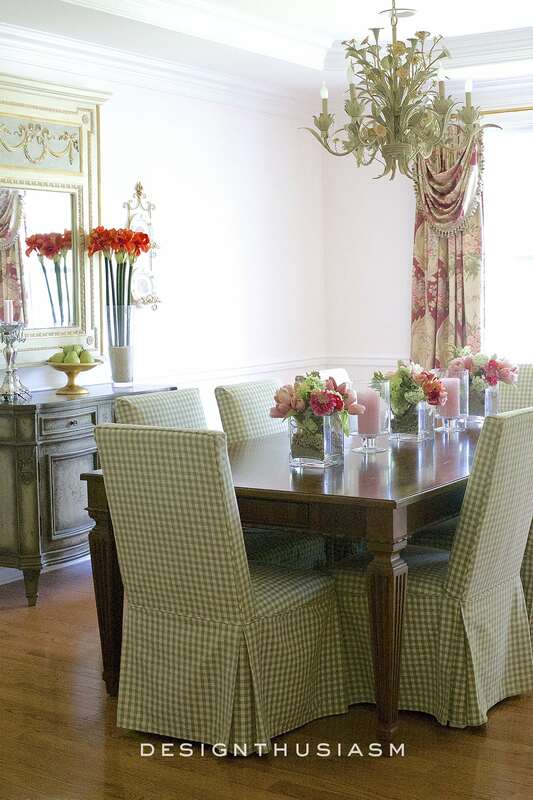 I love the “splash” of color your current drape panel looks in your dining room. 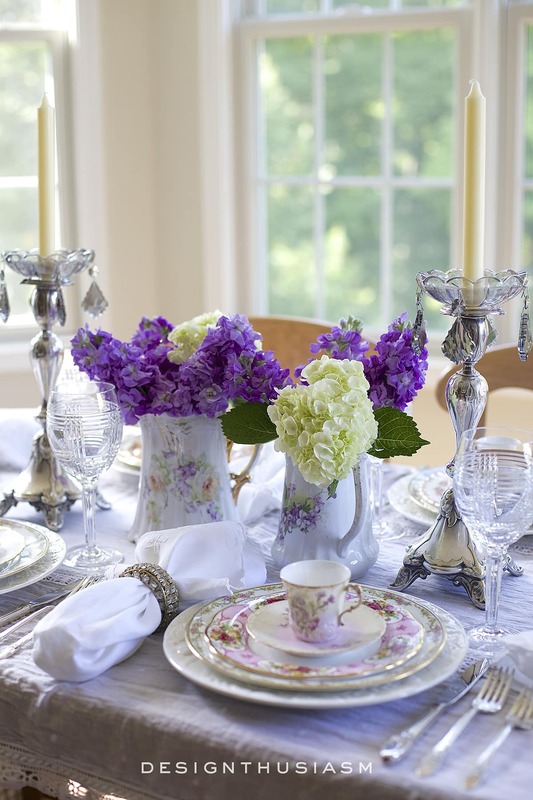 They area a nice backdrop and look complimentary with the new candlesticks you have on the dining table too. Perhaps it was the angle of the photo, my first impression was that the room flowed nicely. 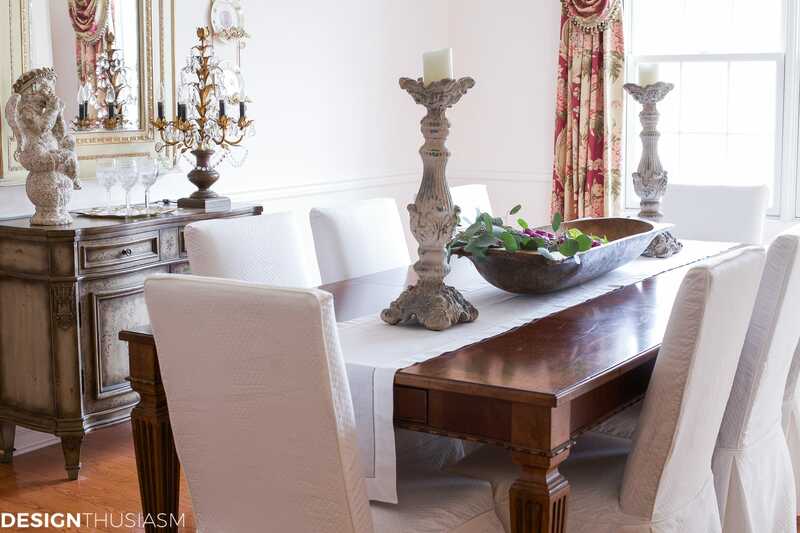 Love the Parson slipcovers, they’re a great contrast to the darker wood dining table. 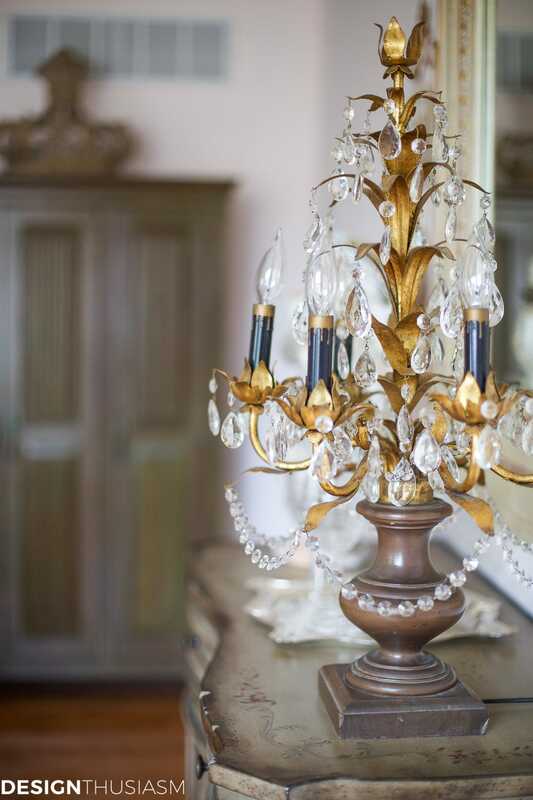 Was wondering, if you install two new sconces next to the mirror (and I love sconces with crystals), will you keep the candelabra on your server? I’m sure with the components that you love, the room will come together beautifully…I enjoy seeing the process! Thanks, Erin!! I expected to keep the drapery panels, but in person, they have a jarring, out-of-place look. 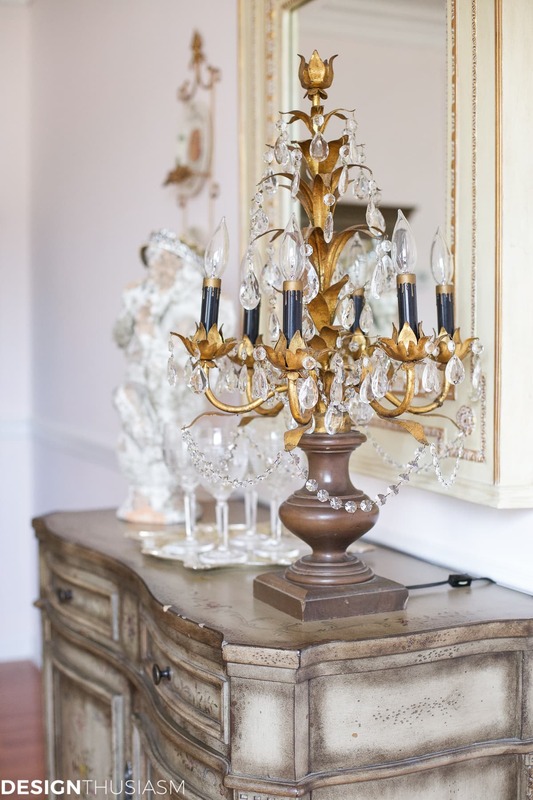 I certainly will keep them, even if I take them down, because I do love the floral, so they can always be put back… 🙂 The sconces I bought are not crystal, so yes, I plan to keep both the candelabra and the sconces. Thanks for visiting!! oh, I do like the new look! The old one was nice too, but I am enjoying the new look. I know the finished product will be exquisite. Great job as usual. Perfect! Because everything is lighter, at first I thought you had re-painted. The blush looks soft and beautiful with the slipcovers. I am fond of your current drapes but your idea of light linen will be stunning. I was thinking a light, almost neutral rug with possibly a bit of gold but I’m anxious to see what you pick. It will be lovely, I’m sure. I love the idea of a library/dining room combination. It’s a wonderful look… 🙂 Sounds like you’ve already done quite a bit in the recent past!! Hi Lory – Even though I thought the previous look was gorgeous with the green and white checked fabric chairs and the floral draperies, I fully understand the desire for change when you find a new look for the adjacent rooms. 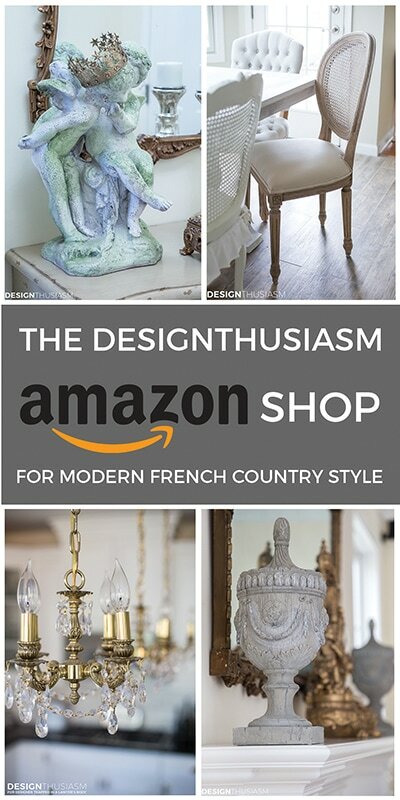 I think the new French vintage look will be exquisite in your dining room. 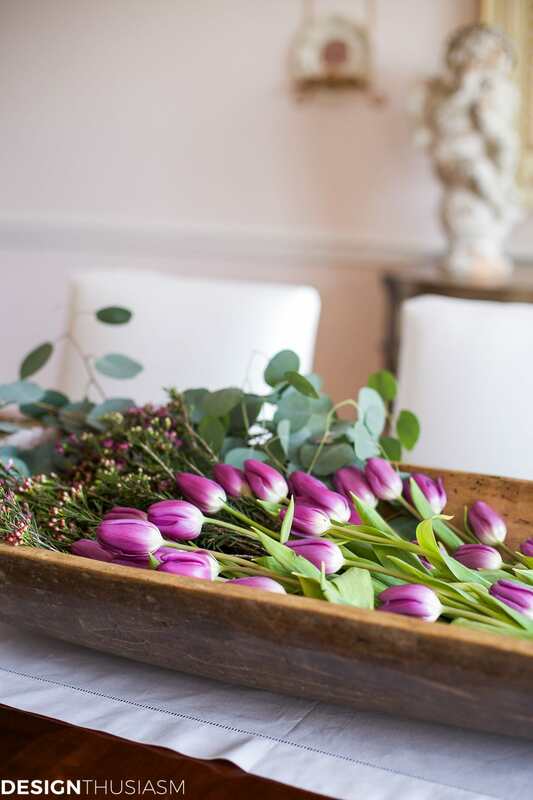 I’m looking forward to seeing if your surprise element is either a new country French table – or if you possibly plan to white-wash the one you have… Either way, I’m sure I will love it as I love your style and love following your blog! C’est magnifique! Ooh, how fun to have people guess! But no, it’s not the table (although I’d really love to replace this one with an old worn French table with tons of patina!) I can’t wait to share!! I’m making small changes in my dining room too! A few months ago I changed the upper doors on my two-piece hutch by replacing the “leaded” glass with wood panels. I added Efex moldings to the doors and painted the entire thing Annie Sloan pure white. I used a mix of clear and black wax to create a beautiful aged gray. Now it looks a lot like the antique armoire that inspired me! I took down the silk drapes on the slider and put up heavy linen panels with a grommet top. I’ve added some new accessories–not as elegant as yours but suitable for my French Country look. I love the “antique” rug I bought! The rug’s soft worn cream, gray and blue colors are so pretty! Last big update will be painting the table skirt and chairs and staining the table top a much richer color. I can’t do that until I decide on the color! Love the new look Lory! The white slipcovers look amazing. 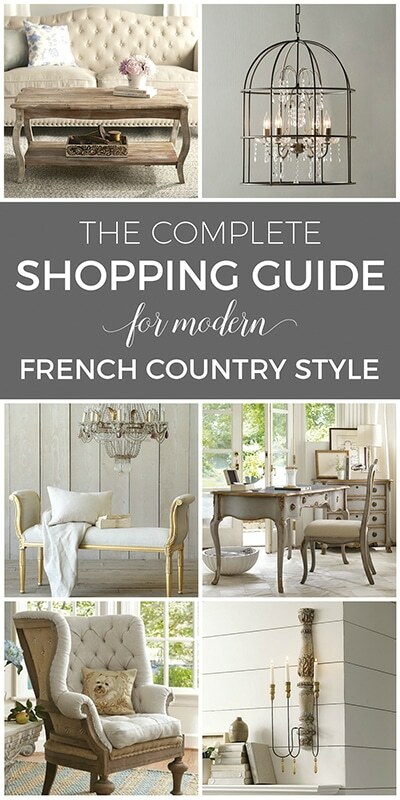 I can see it is coming together into more of your modern French Country style. I can’t wait to see what else you do with the space. 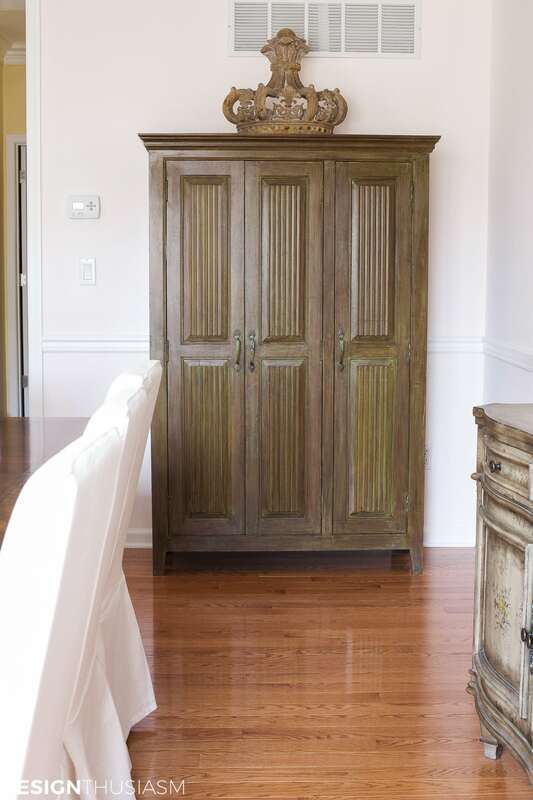 The pantry cabinet will look so lovely painted in a creamy white with a little gray and wood poking through. Hi there. 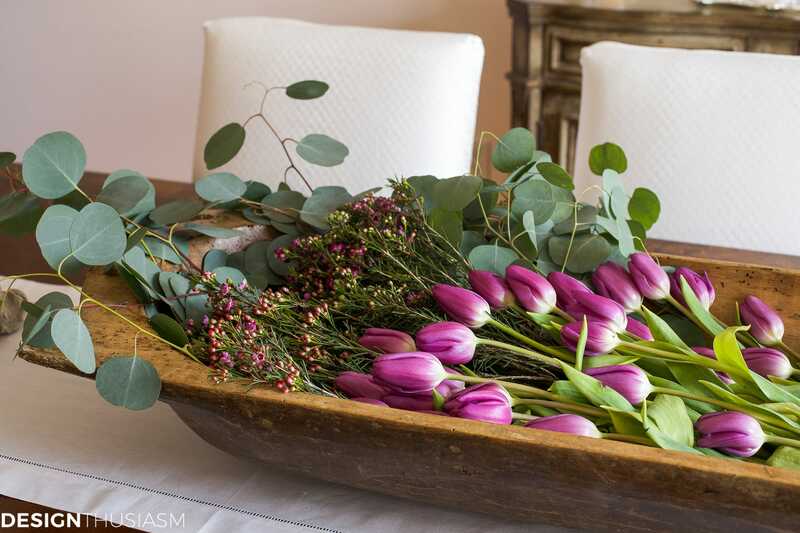 Love, love, love it all; fresh, airy, and, oh, so elegant. Great job! Can’t wait to see the finished look. 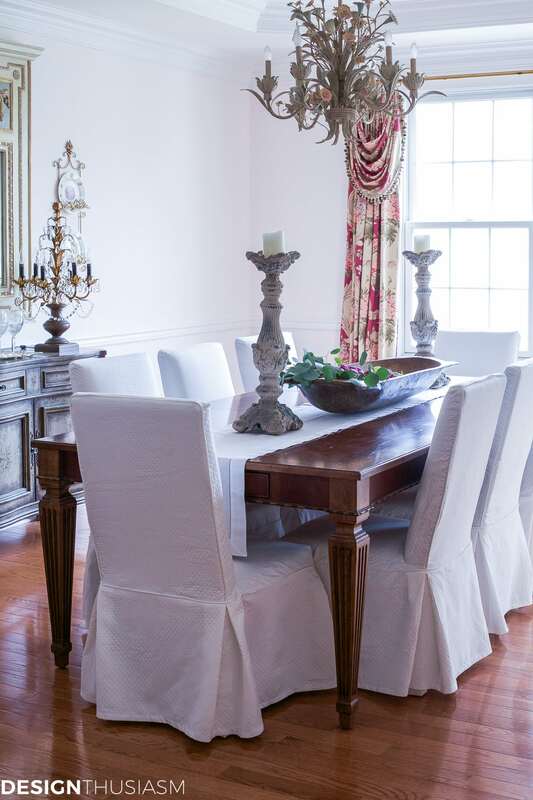 I really like the pulled together appearance of a rug in a formal dining room, although I no longer have one in ours due to the fact of some messy eaters. Chocolate, blueberry stains and the like were just not worth the high maintenance for me. Have a great week-end Lory !! 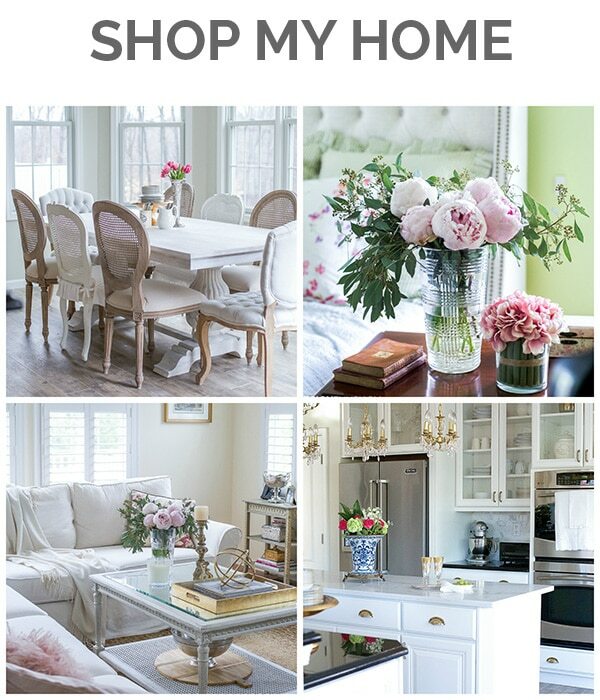 Lory: Lovely post – and I agree with others about the blush color of your walls. 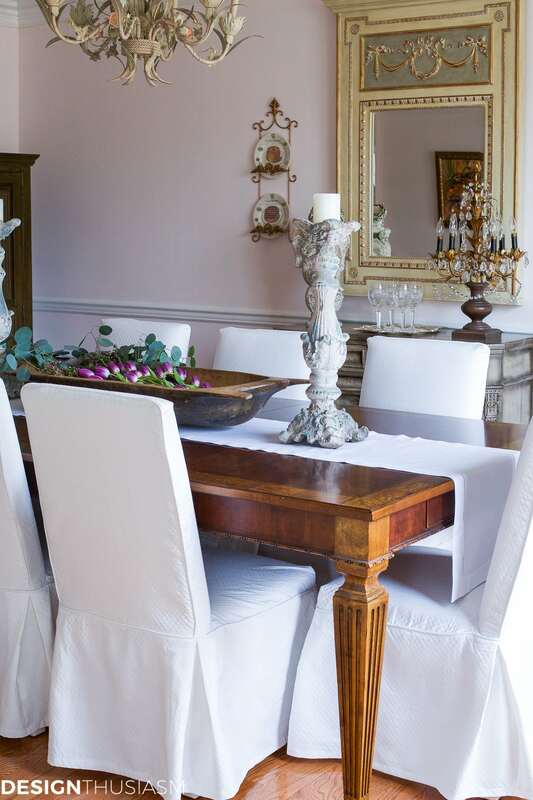 It is lovely, I have often thought of doing a ceiling a blush pink. 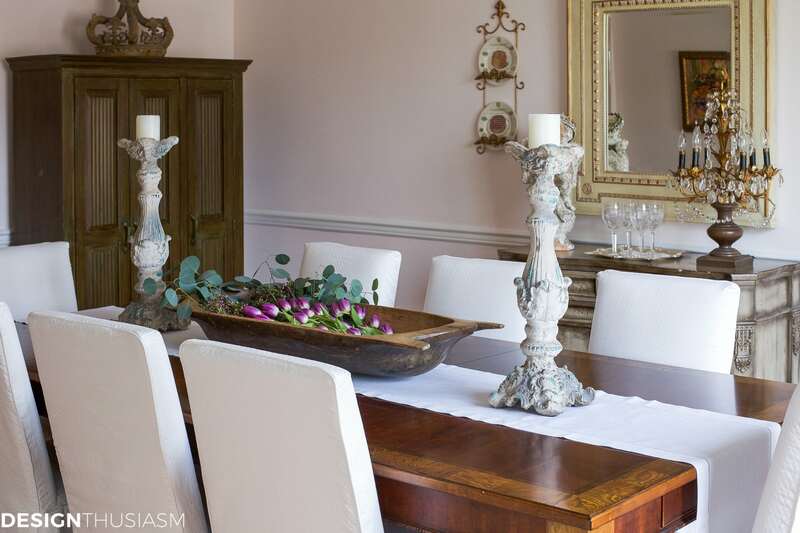 In looking through photos of many old homes in France and Italy – the stone is often aged to a blush. So pretty! 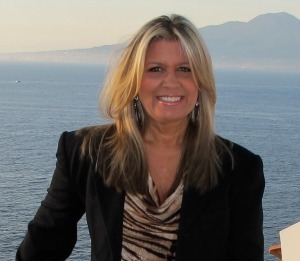 Love your blog – it is inspiration! The new look is gorgeous…thanks for sharing! Transformation is nicely–and gently for husband–done. While blush is not traditional for French style, I bet it looks wonderful in evening light, so hope you keep it and give it a trial period. Very pretty and elegant. 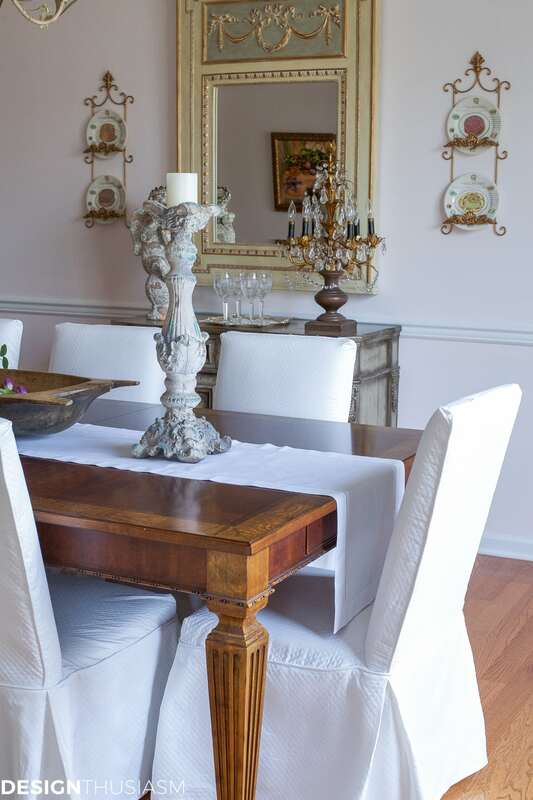 It is all so cohesive and formal but softened with the french touches. Very nicely done. Oh, you are so right to say a room is never done but that is the fun of decorating. The room is so lovely and I look forward to seeing more changes.